Smutty song - Still here! Once upon a time Angel wrote the famous Lockdown series - ok, all of you know it's one of my favorite stories, in fact I think if I had to spend the rest of my life on a desert island with only 10 fics this would be the first to be chosen. Whatever, what you probably don't know is that its last chapter touched me deeply. Why? Because it's B/K; because it's beautifully written; because it's canon; because it's the perfect ending for her fic, and also because it's a songfic. Yes, I love songfics a lot, and this one involves Only when I lose myself, from my beloved Depeche Mode. Hey, don't you remember it? Not a problem, here it goes, kids. You know, this song makes me want to be hugged every time I listen to it. 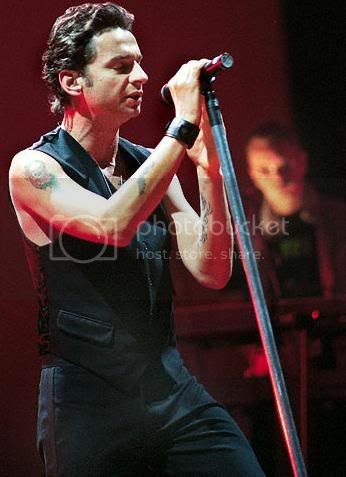 If David Gahan, its singer, could do that while singing it to me I'd be obscenely happy. Here's a photo of him that makes me drool. A lot. If you want to listen to it here's YouSendIt link to download the song. Enjoy!